I introduced International Business Machines Corporation (IBM) as a play on the emerging blockchain technology segment earlier this year to augment its transition away from its dependency on legacy businesses to the future of cloud, artificial intelligence, and analytics. IBM has struggled to restore growth, posting 20+ consecutive quarters of declining revenue however IBM has posted back-to-back quarters of revenue growth as of late. This growth has come on heels of its long-term imperatives beginning to bear fruit in emerging high-value segments that has fundamentally changed its business mix while evolving its offerings to align with new age information technology demands. A new frontier of growth lies in the nascent blockchain technology as IBM is a first mover in this promising, emerging technology. As IBM transitions to quarterly revenue growth, in the backdrop of its evolution to emerging high-value segments (i.e., blockchain) the company presents a compelling investment opportunity considering its suppressed valuation. In addition to the evolving business mix in strategic imperatives, IBM offers a great dividend, share buyback program while continuously acquiring companies to drive the business into the future. Facebook made a major executive move to support its blockchain efforts where the head of its Messenger platform, a board member at cryptocurrency exchange Coinbase and former CEO of PayPal, David Marcus is “setting up a small group to explore how to best leverage blockchain across Facebook, starting from scratch." Mark Zuckerberg said in his 2018 mission statement that he was interested in studying the “positive and negative aspects” of blockchain. Google is now entering into the blockchain space as well via investing in start-ups working on blockchain technology per CBInsights. Google has made six investments in the space which include decentralized cloud storage provider Storj, cryptocurrency derivatives trading platform LedgerX and Veem, a company working on faster and less expensive digital payment services for small- and medium-sized businesses. Google is also invested in digital gift card platform Gyft and Ripple, a company that settles international transactions for banks. Furthermore, Google is developing a blockchain service to support its cloud business, per Bloomberg. Google plans to offer the service on its Google Cloud Platform, as well as a stand-alone version which companies can run on their servers. Ant Financial, a subsidiary of e-commerce giant Alibaba, is using some of the $14 billion treasure chest it just raised to invest in blockchain. "The Company will continue to invest in developing its blockchain, AI, security, IoT, and computing capabilities to upgrade its global technology platform for the next generation," Ant Financial said in a statement. Nvidia’s CEO Jensen Huang was on Mad Money with Jim Cramer recently and stated: "Blockchain's going to be here for a long time and it's going to be a fundamental new form of computing." Going further, "I expect blockchain, I expect cryptocurrency to be an important driver for GPUs" and "Blockchain requires cryptography and the ability to have a public ledger that is completely immutable, perfectly safe, distributed all over the world," he continued. This comprises a very short list of major players in distinct spaces all trying to leverage blockchain technology thus providing a consensus that this will likely be a powerful force for future transactions. IBM’s enterprise blockchain solutions will be a solid growth engine for the company as more companies adopt this technology. Per International Data Corporation (IDC), worldwide spending on blockchain solutions reached $2.1 billion in 2018 through mid-March, compared with $945 million spending in 2017. IDC is projecting that total blockchain spending will reach $9.2 billion by 2021. The United States is the biggest investor in blockchain technology, representing ~40% of the total worldwide spending. 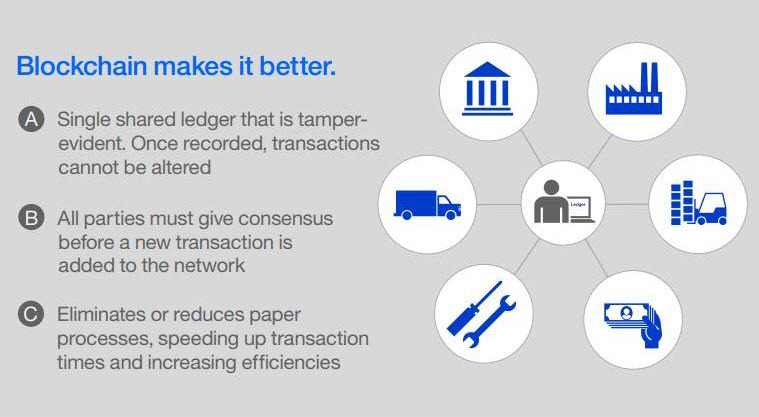 Blockchain has the potential to penetrate the $2 trillion in global payments and $1.8 trillion global supply chain. 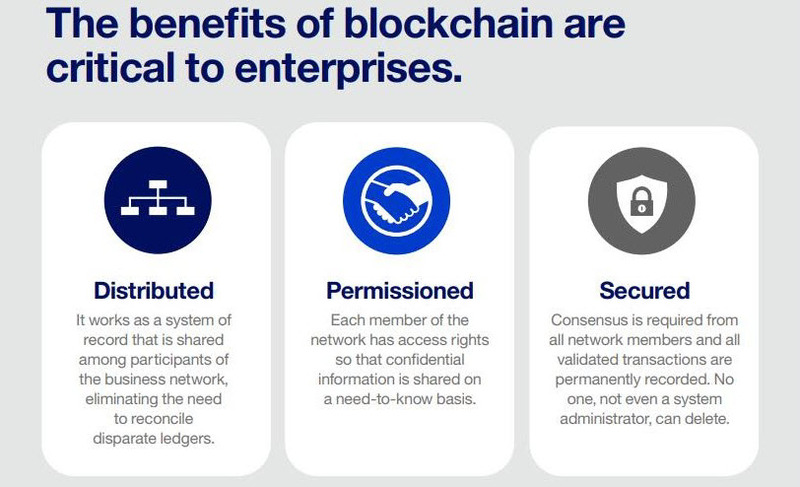 IBM is offering the first enterprise-grade blockchain platform for permissioned networks and is aggressively stepping into the enterprise blockchain solutions space. Any company looking to employ blockchain technology will likely leverage a company like IBM for the blockchain infrastructure as it’s a first-mover in the space and Juniper Research ranked IBM as the top blockchain company in the world with 40% of surveyed tech executives and leaders ranking IBM as their preferred blockchain service provider. 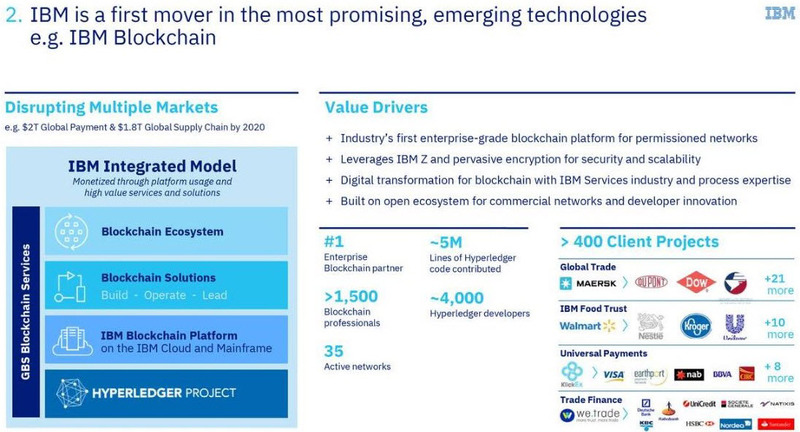 IBM is well positioned as it is the #1 enterprise blockchain partner with greater than 400 projects with world-renowned companies across many different sectors involving transactions such as Dow, Walmart HSBC, Nestle and Visa (Figure 1). IBM briefed investors recently on its blockchain solutions and stated that the company has more than 400 corporate users that are currently managing various projects on the technology. A total of 63 companies are collaborating in IBM-led consortiums with various themes. 25 companies testing IBM’s blockchain operate in global trade, 14 are in global payments, and 15 are in food supply chain management. IBM is working with Walmart on a global food safety project. The objective is to allow Chinese consumers to track the journey of their food products with their smartphones. Other partners in the food industry are Nestlé, Unilever, and Kroger. In global shipping, IBM is working with Maersk, Dow Chemical, and DuPont. Maersk, the world’s largest shipping line, launched a joint venture to track international cargo. In the agreement, IBM will provide the back end and support for the blockchain technology while Maersk will become the first to use the blockchain platform. The new venture is expected to grow with more shippers, ports and customs officials coming into the fold. The new CEO of this joint venture stated that this new company will track 18% of ocean containerized trade on its first day while more than $4 trillion in goods are shipped each year worldwide. IBM’s blockchain is seeing inroads in the finance industry as well with Societe Generale, HSBC, WeTrade, Unicredit, and Santander being top partners. IBM is also working with payment providers like VISA, BBVA, CIBC, EarthPort, and Polynesian payments platform KlickEx. Blockchain technology is the architecture that underpins the volatile cryptocurrency markets. This technology is applicable to enterprise applications since it employs a decentralized database, open ledger, and incorruptible transactional capabilities. Blockchain is applicable to any transactional business model whether it’s financial or goods being transacted. The open ledger concept within the blockchain makes it incorruptible as any changes need confirmation from multiple parties and any changes can be seen at any time within a permissioned blockchain. As a function of the decentralization, there’s no central repository or clearinghouse to be hacked or accessed. The blockchain speeds up and by-passes these intermediaries (i.e., clearinghouse or bank) to achieve transactions within minutes and not days (Figures 2 and 3). The distributed ledger within blockchain establishes a shared, irreversible record of all the transactions that take place within the network. The blockchain enables permissioned access to data in real-time. This allows multiple parties involved to collaborate utilizing a single shared view of a transaction. International Business Machines Corporation (IBM) has repositioned itself for future growth with new and emerging end markets, and to this end, IBM has acquired 35 companies over the past three years. Its long-term imperatives are beginning to bear fruit in emerging high-value segments that has fundamentally changed its business mix while evolving its offerings to align with new age information technology demands. A new frontier of growth lies in blockchain technology as IBM is a first mover in this promising, emerging technology. IBM is aggressively stepping into the enterprise blockchain solutions space, and it may be a substantial growth engine for the company. IBM is offering the first enterprise-grade blockchain platform and is the #1 enterprise blockchain partner with greater than 400 projects with world-renowned companies across many different sectors such as Dow, Walmart HSBC, Nestle, and Visa. IBM offers a compelling long-term investment opportunity given its attractive valuation, dividend, share buyback program and growth initiatives with secular trends and long runways into the future. Disclosure: The author holds shares of IBM and is long IBM. The author has no business relationship with any companies mentioned in this article. He is not a professional financial advisor or tax professional. This article reflects his own opinions. This article is not intended to be a recommendation to buy or sell any stock or ETF mentioned. Kiedrowski is an individual investor who analyzes investment strategies and disseminates analyses. Kiedrowski encourages all investors to conduct their own research and due diligence prior to investing. Please feel free to comment and provide feedback, the author values all responses. The author is the founder of stockoptionsdad.com a venue created to share investing ideas and strategies with an emphasis on options trading.